Critics often claim that electronic cigarette companies are using fruit and candy flavors to entice children, completely overlooking the fact that adults enjoy these flavors just as much as kids. It’s an argument that vapers have been making all along – that tasty flavor varieties help them quit smoking and stay away from traditional cigarettes. Rather than pointing out this helpful benefit, the media often focuses on “the children” and anti-smoking groups’ claims that e-cigs are dangerous. Well a new survey has provided some credibility to the vaping community, suggesting that a wide variety of flavors may be beneficial. And it’s more evidence that strong regulations (like limiting electronic cigarette flavors) will do more harm than good. Alcohol companies have been offering fruit and candy-flavored liquor drinks for years. Varieties such as “Fruit Loop”, “Cupcake”, “Fluffed Marshmallow” and “Strawberry Shortcake” are just some of the options lining the shelves at most local convenience stores. Yet critics are quick to slam electronic cigarettes, charging the industry with targeting children and providing a “gateway” product that will eventually lead to smoking. There are lots of reasons this claim is just plain ridiculous, but when it comes to the critics’ primary complaint… IT’S THE SWEET AND FRUITY FLAVORS. Over 15 days, 4,618 participants were gathered from online forums, social media websites and advocacy groups on SurveyMonkey.com. 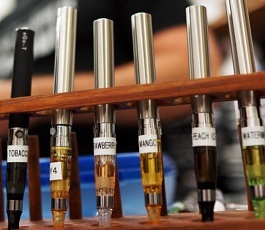 Participation was open to any vaper – regardless of age and previous or current smoking status. Of the participants, more than 90% were former smokers, the mean age was 40 years old and the respondents were predominantly male. The survey produced some interesting results, especially when it comes to adults’ view of e-cigarette flavors and how they impact their vaping experience. Most vapers are familiar with the path outlined in this survey; first-time users almost always start out with tobacco flavors, and as they become more accustomed to electronic cigarettes and vaping technology, they move on to sweet and fruity flavors. The survey also suggests that transitioning to new flavors may actually reduce the craving for traditional cigarettes. Tobacco and menthol may act as a good transition, but users almost always experiment and move on to other varieties. More importantly, the survey finds that adult users see these flavors as an IMPORTANT FACTOR in their ability quit smoking and would find it more difficult to stay away from cigarettes if their options were restricted. Although a definitive study may be warranted, the survey was published in a peer-reviewed academic journal and it’s findings can’t be overlooked. The fact that ex-smokers change flavors regularly and prefer options other than tobacco supports the suggestion that flavor varieties (especially the sweet and fruity options that anti-smoking groups are trying to ban) are an important factor in helping smokers quit. It should come as no surprise that teens are attracted in e-cigs, but there is no evidence to suggest that flavors perpetuate teen usage. Creating age restrictions is one thing, but to limit adults’ options when there is a clear link between flavor variety and successful smoking cessation, may actually do more harm than good. WE VOTE FOR FREEDOM! WE VOTE FOR FLAVORS!